Sierra Leone's preparations for their 2012 Africa Cup of Nations at home to Niger on 4 June are in disarray after the naming of two separate squads. One provisional squad was selected by local coach Christian Cole, who is recognised by the Sierra Leone Football Association (SLFA). 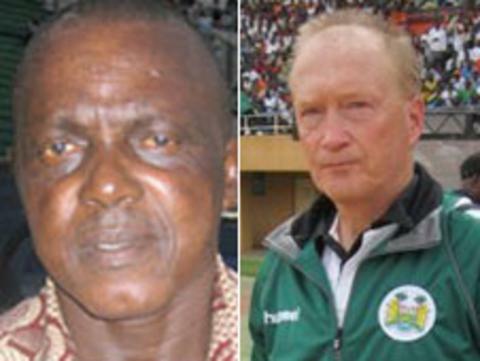 Swedish coach Lars Olof Mattsson, who was appointed by the country's sports ministry, appointed the other list. Cole has named 33 players in his squad while Mattsson picked just 24. Mattson was originally contracted to coach the Leone Stars for just one game and that was the last 2012 qualifier in Niger in Niamey in March. Despite losing that game 3-1, his contract was then extended by the sport ministry to lead the team for the remainder of the 2012 qualifiers. However the SLFA has refused to recognise the Swede as coach of the Leone Stars and insist that Christian Cole is in charge of the team for the rest of 2012 campaign. The SLFA says its executive has still not considered Mattsson's credentials, which have been forwarded on by the sports ministry. Cole has included 13 overseas players and 20 home-based players in his list and has already started training in Freetown. Mattsson says he will fly into Freetown early next week to begin training with his squad, which includes 22 foreign-based players and only two from the local leagues. Interestingly all the foreign-based players that Cole has chosen, with the exception of Finland-based Sam Obi Metzger Jr, are also on Mattsson's list. One name that is on neither list is former Inter Milan striker Mohamed Kallon, who is currently without a club.